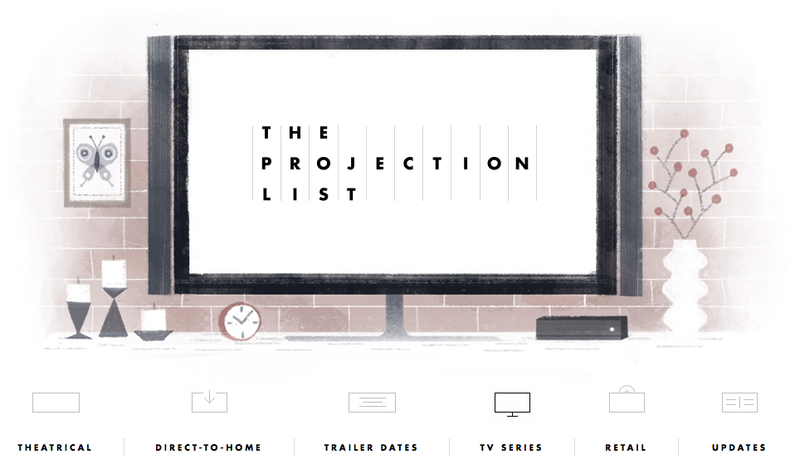 Debuting today, The Projection List is presented as a resource tool: on one site, users can find theatrical, OnDemand, and Retail release dates for what looks generally to be the vast majority of motion pictures. This information is available elsewhere, but often scattered, meaning significant work is necessary to track those dates effectively. Many who write about or follow film are celebrating the site as the resource it strives to be. However, the site’s choice to include television has created a point of trouble for me, personally. The idea of including television makes sense: many who follow film also follow television, and the retail section logically follows both film and television releases. Television and film share both cultural mindspace and retail shelf space, and so the presence of television is itself logical. The fact that the site isn’t willing to function as a comprehensive television guide is not in and of itself problematic: TV.com is joined by other sites like The Futon Critic, which work as quick-glance resources for what’s new on a given night. To take on that task would be incredibly challenging, and so limiting your selection is logical and understandable. There are two central problems with this. The first is that “cinematic” is an empty aesthetic judgment, not an organizing principle. When placed in front of television, “cinematic” really just means that the person saying it wants to distinguish something as better than something else. It doesn’t mean anything: no one has ever defined “cinematic television” as a specific set of characteristics, and no one ever will, because it exists primarily as a point of aesthetic distinction subject to the user of the word’s evaluation of a given set of programs. I shall direct to Newman and Levine to avoid extending the point further, but my basic point is that using “cinematic” as a term of categorization lacks any clear set of parameters, and says more about the person creating the list than the shows that are on it. As I was writing this, I saw a Twitter conversation where the person in question, site editor Ted Smith, addressed the subjective nature of this term, and was successfully convinced to change the wording to something else (potentially “popular cable shows,” based on the tweet in question). This is a step in the right direction, but “popular” doesn’t work given how few people watch many of the shows on the list (like HBO’s Sunday comedies) compared to those watching scripted series on USA. And, speaking to the second problem, it doesn’t change the basic fact that this is ultimately a list of what channels and series the site’s creator deems worthy, thereby reinforcing a limited spectrum of programming where “notable” series lie. The use of “cinematic” is being used as justification not just to avoid covering the entirety of network television, but also to limit focus to AMC, FX, Showtime, HBO, Cinemax, and streaming services. The list also includes series from BBC America and PBS, but there are other series on those channels conspicuous in their absence—Broadchurch, and Masterpiece’s Grantchester—that suggest Smith has only included the other series based on their cultural capital. Moreover, there are scripted series on channels that are ignored entirely that are excluded, which notably include scripted dramas targeting female (Bravo’s Girlfriend’s Guide To Divorce or VH1’s Hindsight) and African American (BET’s Being Mary Jane) viewers in addition to channels that more clearly fit the niche Smith is serving with his existing choices (Sundance Channel, for example, which debuted Babylon this week, or Pivot, whose first drama Fortitude debuts this month). These absences are no different from what happens in critical discussion of television—which has also struggled to engage seriously with scripted programming from BET, among other channels—and Smith is replicating these absences because his site is clearly aimed at similar demographics. However, while this is explained—if nonetheless problematic—in the context of criticism by the assumed role of editorial discrimination in what a given site covers, such discrimination in a database is more challenging. Smith suggested on Twitter that he intends to work toward the right wording, and I appreciate such efforts, but I would argue there is no wording other than “This list is a subjective evaluation of notable cable television series based on my personal impression of their quality and their relevance to a specific audience of Internet users” that would capture the current categorization strategy. Unless it shifts to a list of every single-camera scripted cable series, at its core lies a set of values with no basis in discernible categorization, and with a problematically limited scope of the diverse and expanding realm of scripted cable programming. For a site that on the cinematic side gives promise to small distributors whose releases might get ignored by bigger sites, it would be unfortunate if its contribution on the television side remains so limiting in an age where the “barriers” for where great television takes place are breaking down. I support the effort to connect film and television through this database, but it’s created a troubling set of parameters that have at least initially suggested the site has a problematically limited view of the television landscape.